This is the second fashion in the Chanel series. 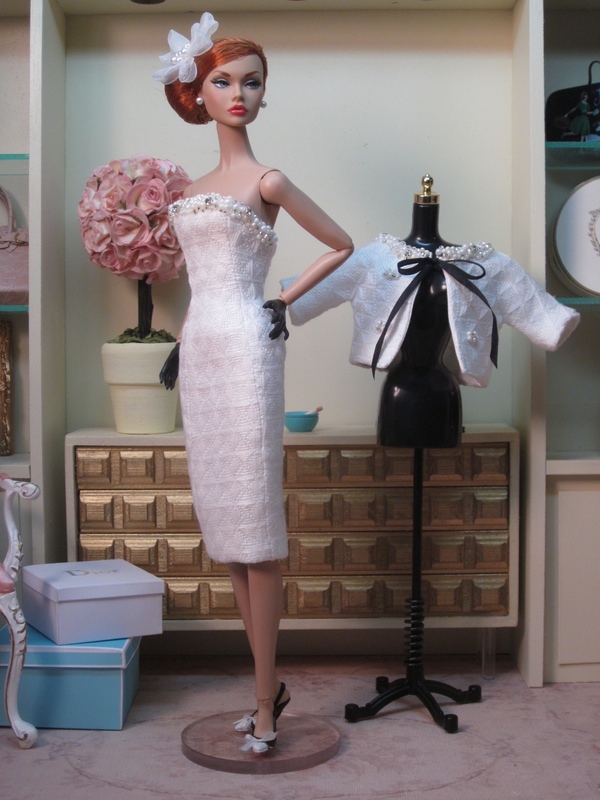 Poppy models a pure white ensemble inspired by a look in the Chanel Fall 2015 collection. The fabric is a cotton pique with a subtle woven diamond pattern. The cropped, boxy jacket has elbow length sleeves and is fully lined in white silk. The neckline is thickly hand beaded with a variety of pearls, beads, and crystals. Delicate black silk ribbon ties at the neckline. The accompanying strapless sheath is also thickly beaded along the top of the bodice. A chiffon flower hat with a pearl center is the perfect finishing touch. I’m at car show and have my iPad and trying to buy but won’t take my password. Haven’t a clue but tried everything. If still available, would love to have it but can’t pay till I get home later in day. Possible to save for me? If gone, I understand.